These are the words that I most associate with my colleague, Pastor Samrach Nuth. I’ve lost count of the times he’s said this after I’ve brought up some issue that troubled me. “We are the sons and daughters of the Living God,” he added yesterday, by way of explanation. Other times, he’s followed his usual “Don’t worry. It’s okay” with an assurance that God has called him to be a leader in this church, and whatever God wants him to do, he will do, humbly. Or he reminds me not to worry because when we believe in the Lord Jesus Christ, it changes us. Not only on the outside, but on the inside, too. When Samrach told me his story, I realized that his deep confidence that all will be well has been hard earned. 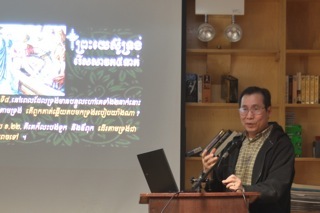 Born in a rural Cambodian village, he moved to Cambodia’s capital city, Phnom Penh, in the 1970’s as a young adult. Like most Cambodians of his generation, he was drafted into military service, and so he worked by day as the receptionist for a general in the Cambodian army. By night, Samrach worked in his brother’s jewelry store, where he learned the trade of a jeweler. When the communists took over Cambodia, Pastor Samrach was forced to move to a rural area and work on a farm. He was moved around from one farm to another for several years. When the Vietnamese invaded Cambodia on January 7, 1979—a date Pastor Samrach rattled off, unprompted, with the quick recall of something seared unforgettably in his mind–he had to walk from where he’d been farming back to his home village, entirely on foot. It took him over a month. Samrach stopped talking at this point in his story, shook his head, and looked down into his lap. So I don’t exactly know what happened to him next, or what he saw when he finally reached home. But I do know this: twenty-eight members of Samrach’s family, including six brothers and sisters, were killed by the Khmer Rouge Army. Samrach was not yet a Christian then. Like most Cambodians, he grew up Buddhist. But he has told me many times that after he became a Christian, he learned to forgive Pol Pot and the Khmer Rouge. “When I became a Christian, I didn’t hold that against them,” he says. He’s told me he’s forgiven the Khmer Rouge so many times because I keep asking about it. Even as a follower of Jesus, it’s difficult to imagine how someone could have the grace to forgive such unspeakable crimes. But over many tellings, I’ve come to trust that when Pastor Samrach says, “Don’t worry, it’s okay,” he is drawing on decades of grace and forgiveness that run deep and true. Samrach’s story reassures me that God’s faithfulness is sufficient, whatever we may encounter. Thanks for posting Pastor Samrach’s story, Kristin. Could you also post the street address of Pastor Samrach’s jewelry shop in Chicago? I’d like to give him some business! Thank you for sharing this with us, Pastor Kristin! It is a very touching story! Pastor Samrach, Thank you for your faithful service to God, Living Water Community Church, and the ongoing ministry in Cambodia! Thank you for modeling God’s grace and forgiveness! We are blessed to know you, and all the Cambodian brothers and sisters who worship with us! May God bless you and sustain you! This is a wonderful story about a very committed brother who has taken on a large family. Kruu Samrach, thank you for all your work, from helping people move to being a liaison between the Cambodian and other LWCC communities to ministering to Cambodian sisters and brothers in times of need. LWCC is blessed that you are part of us. Kristin, thank you for telling Samrach’s story! What beautiful testimony to all we have to learn from each other!